Neck Posture Pump - Cervical Disc Hydrator - SHIPS FREE! Neck and Back Posture Pump - Dual Disc Hydrator - SHIPS FREE! Neck & Back Posture Pump - MANUAL Deluxe Full Spine Treatment - SHIPS FREE! Posture Pumps manufactured by Posture Pro gradually lift, stretch and separate the neck and back joints into their proper curved shape. As the spine is stretched and curved over uniquely angled air cells of the Posture Pumps, compression is removed from the discs and nutrient-rich fluid can now be absorbed into the joints. Various body positions can force the spine out of its natural curved shape, causing disc compression and loss of joint lubrication. Dry joints wear unevenly, age rapidly and become stiff and painful. The Posture Pumps are a revolutionary patented breakthrough that counteracts this common problem. Posture Pumps are personal health devices designed to stretch the neck and spine. Using the Posture Pumps to limber up your vertebrae may result in a healthier spine. Since the Posture Pumps are hand operated, you control the pace of the device. As Dr. Richard Graham, inventor of the Posture Pump states, "Improperly shaped, non-mobile spines are the clogged arteries of the future." Preventitive measures today may save pain and greif tomorrow. Posture Pro Posture Pumps are designed to treat specific areas of the spine and neck or the entire spine. 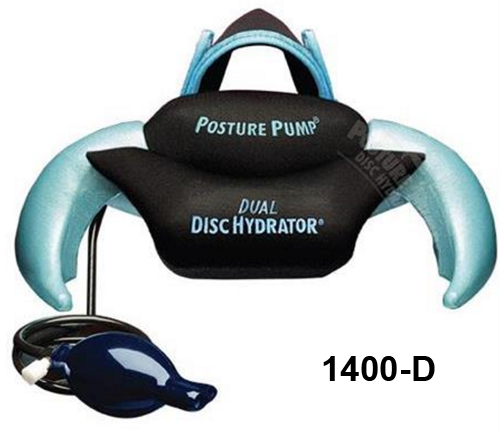 The first model is the Cervical Disc Hydrator that is used as a Neck Posture Pump. An Elliptical Back Rocker is used for a Lower Back Posture Pump. 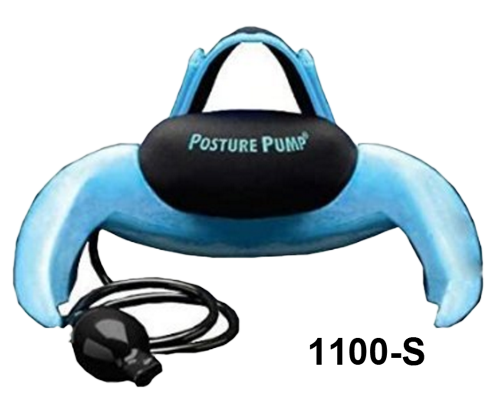 Posture Pro also manufactures two Full Spine Posture Pumps, one is manual while the other is electrically pumped. Relieves neck stiffness, headaches and fatigue. Treats the cause of neck stiffness and discomfort fast. Patented up and down motion promotes disc lubrication and joint nutrition. Dramatically reinforces the cervical curve. Lightweight, portable, easy to operate and travel. Beautifully crafted, made in the USA and built to last. 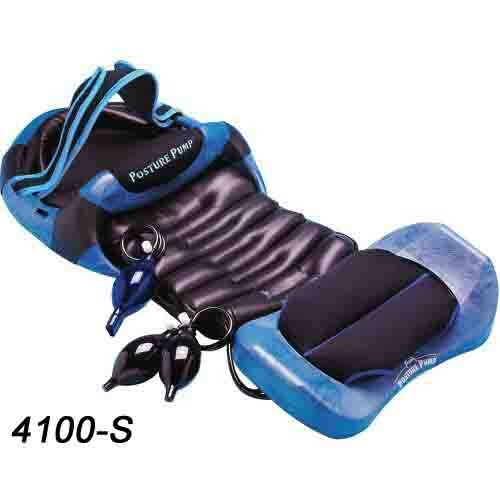 The Dual Disc Hydrator Posute Pump works the neck and upper back. Upgraded from the Model 1100-S to decompress in two areas with even more comfortable corrective deep relief! 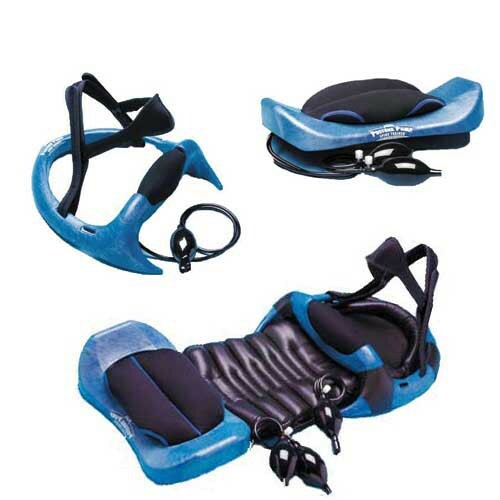 Two uniquely angled EED® air cells* decompress and shape the neck and upper back (hump region) to relieve compressive forward upper body posture. New Comfort Visor™ gently molds to the shape of the forehead (no chin or jaw contact). Does not hyper-extend the neck. Operating at moderate pressure levels, the “Dual” provides extremely comfortable disc decompression & hydration while shaping and restoring the proper neck curve. The Posture Pump is a lightweight and cost effective apparatus that employs Expanding Ellipsoidal Decompression. Compressed cervical and low back joints and discs are simultaneously decompressed and aligned in a curved configuration. MRI studies have concluded that this unique patented action separates the joints at the front and back aspect of the discs to coincide with their natural wedged spacing. This allows discs protrusions to be drawn into the proper disc allignment. Relieves back stiffness and discomfort. Dual inflation mechanism gradually lifts, stretches and separates the joints. Two uniquely angled air cells create multi-vectored force and promote disc and joint lubrication. Built-in Rocking Mechanism allows you to excercise your abdominal muscles while shaping and stretching the lower back. Sciatica is chronic pain that affects the lower back and hip. The Penta Vec® 2500, lifts and expands the lumbar spine while the sacrum and pelvis are rotated up and translated away. The feeling is one of lightness and freedom from the monotonous compressive coiling in the lower discs and joints. The Penta Vec provides an expanding ellipsodal decompression of the lumbosaral region. The Penta Vec 2500 ofers a unique blend of five simultaneous force vectors that cannot be manually duplicated. 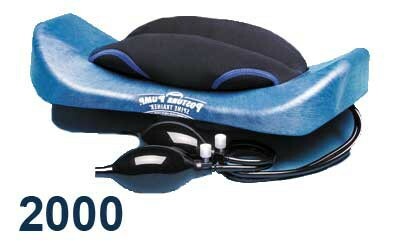 The Posture Pump® PentaVec® (Model 2500) is also a very effective treatment for painful back stiffness. With your lower back gradually lifting with air and expanding into proper posture, use your feet to push up and out with the decompression pedal to gently stretch open and hydrate painful joints, compressed discs and irritated nerves. PentaVec® rapidly gets to the cause of disc compression and allows you to carefully stretch out painful back stiffness at your own pace. Expanding Ellipsoidal Decompression (EED®) gently molds your lower spine into proper posture while nutrient rich fluid is drawn back into the discs as they expand (imbibition). The PentaVec® lifts and expands the lumbar spine while the sacrum and pelvis are rotated up and translated away. The feeling is one of lightness and freedom from monotonous compressive coiling in the lower discs and joints. The PentaVec® delivers 5 simultaneous force vectors into the lower spine and cannot be manually duplicated. Provides effective treatment for painful back stiffness. Gently molds your lower spine into proper posture. Has kickout device that the model 2000 does not have.. Single EED® air cell* decompresses and hydrates cervical discs, while shaping & restoring the cervical (neck) curve at moderate pressure levels for comfortable, corrective deep relief. Simultaneously, two opposing air cells in the lower back unit get to the cause of pain and stiffness fast. Leatherette comfort pad attaches both neck and back units into one. Conveniently folds & locks together for easy travel. Leatherette comfort pad attaches both exercisers and conveniently folds and locks together for easy travel. Leatherette comfort pad is designed to stretch and fit all body types. A must have for sufferers of neck and back stiffness and discomfort. Easy to operate at home or while traveling. Posture Pro Posture Pump Warranty: 6-month limited. Shipping & Handling charges are non-refundable for these items. Our price does not include evaluation or training by a health care professional. While Posture Pump products can be purchased through Vitality Medical, the manufacturer highly recommends that you contact a health care professional and receive personal training on the use of all Posture Pump products. In all cases, a health care professional should be consulted before beginning any exercise program.